Remission - Sale Price 35.90/4lbs, Feed daily to horses to prone to the risk of Founder or are Foundered. 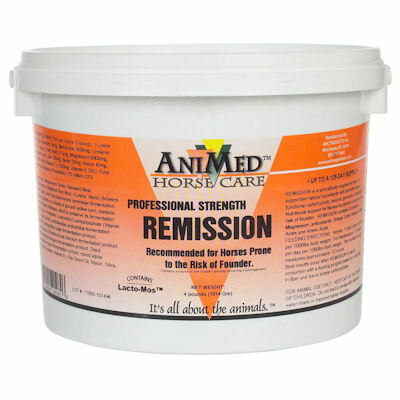 Remission (Ani Med) is a palitable grandular daily supplement for horses prone to the risk of founder. Contains 6,000 mg magnesium and 14 mg chromium per ounce, along with antioxidants, Omega-3 and Omega-6 fatty acids, plus all the essential amino acids. Feed 1 oz. per day per 1,000 lbs. body weight until symptoms subside, then feed 1/2 oz. per day. Equine laminitis is a vascular disease associated with areas of ischemia or hemostasis within the laminae. The laminae secure the coffin bone/distal phalanx to the hoof wall. Inflammation associated with delamination interferes with the wall/bone bond. In advanced laminitis, the coffin bone becomes detached from the horny wall and may rotate or sink. In lay terms, this is known as “founder,” from the maritime term meaning to sink. Aids in pain relief and in reducing motion limitation.